If you’re looking for public land hunting opportunities, consider applying for the FWC’s quota/limited entry hunts for deer and hogs as well as hunts for families, youth, people with disabilities, bowhunters and those hunting with muzzleloaders and modern firearms. You also can apply for special opportunity fall hunt permits, which provide access to large areas with low hunter quotas. Special-opportunity permit fees range from $50 to $175 and offer permits for deer, wild hog and more. We also issue permits for hunting on five national wildlife refuges in Florida. Jump on these opportunities as soon as possible because the phase 1 application deadline is midnight on June 15. 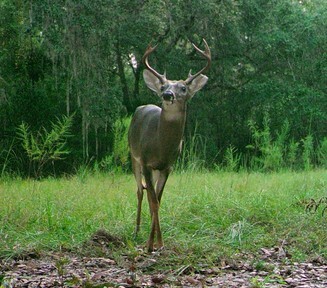 Get more details about fall quota/limited entry hunts and apply at GoOutdoorsFlorida.com. The best first step for all would-be hunters is taking a hunter safety course. And the best time to take a class is NOW. Classes are being offered across the state, but they fill up fast. People born after May 31, 1975, must complete the FWC’s hunter safety class before they can buy the type of hunting license that allows them to legally hunt alone. Even if you were born before June 1, 1975, and are exempt from having to take the class, it’s still a good idea to take the course because you’ll learn so much. 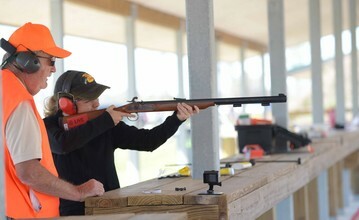 Hunter safety classes cover firearms safety, wildlife conservation, responsible hunting and more. You can attend a no-cost traditional classroom course. Or you can complete the classroom portion online. FWC’s website offers several online courses including a FREE option. After you finish the online classroom portion, you'll need to sign up and attend a skills day to successfully complete the course. 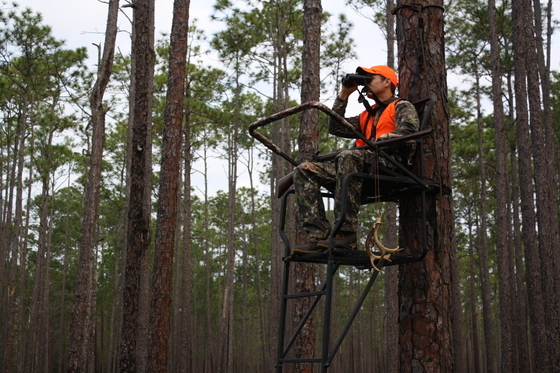 The FWC has contracted with Responsive Management to conduct a study about Florida hunters’ participation in deer hunting and deer harvest success. You may receive a phone call or an email from the FWC and Responsive Management asking you to participate in a survey. We encourage you to respond because it’s important all those with a hunting license who are contacted provide information to help us better understand hunters’ participation and harvest success. If you have any questions about the study, please contact Cory Morea, FWC Deer Management Program Coordinator, at Cory.Morea@MyFWC.com. The support and efforts of the FWC’s partners and the public are important in the fight against invasive species in Florida. Everglades National Park continues to work with the FWC to expand efforts to remove Burmese pythons from within the park. 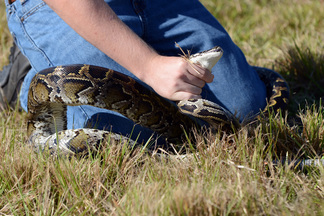 A partnership will expand the park’s Python Removal Authorized Agent Program by allowing paid FWC contractors to remove pythons in Everglades National Park. Learn about our Python Removal Contractor Program and how you can help. If you’re heading outdoors this summer, make sure you take precautions to avoid tick bites. Tick bites can transmit diseases to humans such as Rocky Mountain spotted fever, Lyme disease and other illnesses. You can prevent tick bites by using repellent that contains 20-30% DEET and apply permethrin to clothing and gear. Ever wonder how to remove a tick? There are a lot of theories but Florida Health has best practice advice for removing ticks. Photo courtesy of Florida Department of Health. Are you seeing fawns in your area? 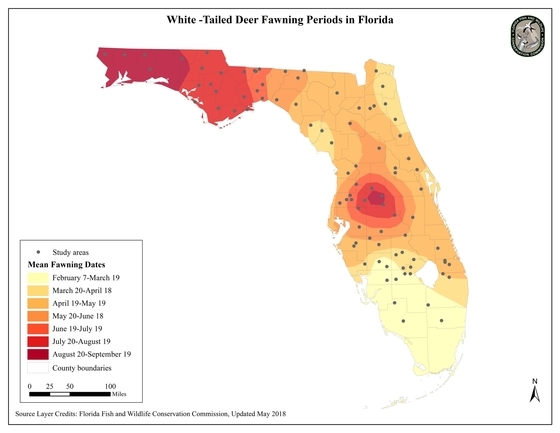 Because peak rut dates vary from July to February in Florida, peak fawning actually started in early February in south Florida and runs through mid-September in northwest Florida and Zone B. Florida has the greatest range in fawning dates, partly due to our long growing season and mild winters. Take this opportunity to remind your friends and family if they see a fawn, the best thing to do is leave it alone. Newborn fawns have no scent and during this time the female limits contact with the fawn so her scent won’t attract predators. Rest assured, the doe is not far away! WMA regulations brochures are available only online. Download or print a copy before heading afield. There are several organizations in Florida working diligently on behalf of conservation and creating opportunities for others to experience hunting. Learn more about how you can get involved in Florida!